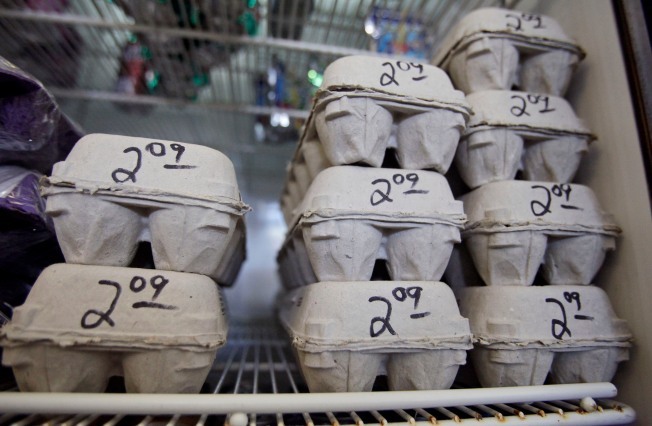 Fresh egg cartons are priced at a local market Wednesday, Aug. 18, 2010, in Los Angeles. Buckwheat, 48, plans to buy organic eggs for her family in the future even though that will mean making a special trip to a local farm. While the recall may spur dietary changes, such as the throngs now turning to farmers markets, it’s not clear how long the resolve of people like Buckwheat will last. Even she allows that the best intentions can fall by the wayside when buying organic means that busy working parents will need to make special shopping trips. Experts say that while it’s typical for there to be radical changes in the short term, it’s too soon to predict whether the egg recall will affect Americans’ buying habits over the long term — whether it will spawn a boom in veganism, for example. But if the reactions to past recalls are any indicator, dietary changes for most people will be short-lived. Poll: Has the egg recall changed your shopping habits? “I think the initial reaction — the flash in the pan scare where we get edgy looking at the eggs in the fridge even if they aren’t on the recall list — will pass and then things will go back to normal for many people,” predicted Jennifer Jordan, an associate professor at the University of Wisconsin-Milwaukee and a researcher who has studied the growing heirloom food and kitchen garden movements. That’s the way it went after the spinach recall, said David Yusko, a clinical psychologist at the Center for the Treatment of Anxiety at the University of Pennsylvania. “For a few months people substituted lettuce for spinach in their salads, but after the scare subsided the vast majority of people went back to their normal eating habits,” he adds. People generally don’t tend to change eating behaviors unless they are personally sickened, Yukso said. He suspects that many will continue to eat eggs even while the recall is ongoing. They’ll just be careful about how the eggs are prepared. Ultimately, long term dietary changes occur only when people aren’t particularly fond of a food in the first place, said Brian Wansink, the John Dyson Professor of Marketing at Cornell University, author of “Marketing Nutrition” and an msnbc.com contributor. Next Wansink coupled the scary news reports with generic beef ads, like the one with the slogan “Beef, it’s what’s for dinner.” The result: Study volunteers wolfed down their burgers. “We learned that a feel-good campaign from a commodity board like that almost erases the negative impact of bad press because it reminds people of why they liked the product in the first place,” Wansink said. Jordan, the Wisconsin researcher, allows that it’s possible that people will get in the habit of buying organic or eating a safer substitute they discovered during the recall. She points to the growing organic food market as proof that change is possible. In the meantime, there are plenty of shoppers with a philosophical attitude toward recalls. As Veronica Soultz, 39, stood near the egg counter at the Pilesgrove Township, N.J. ACME supermarket she noted that she and her family ate spinach throughout the recall of that product. She says she has no intention of giving up eggs now.